Merrifield Garden Center is an award-winning garden center, nursery and landscaping company that was established in 1971. Since we first opened our doors, our goal has always been to provide you with exceptional quality, superior selection and outstanding service. Family owned and operated by the Warhurst and Williams families, we have grown to become one of the largest and most complete nurseries in the country with over 2,000 varieties of shrubs and trees and over 5,500 varieties of annuals and perennials. We have everything you need and more than you can imagine to bring out the best in your garden and home. Our custom landscape department has the creativity, expertise and resources to handle any landscape project - big or small. Our goal is to exceed your expectations and be competitively priced. E.S. Paving has the experience and knowledge of 5 generations of asphalt paving experts. We are a local company consisting of the most skilled, best trained project consultants and installation technicians available. We cater to all jobs, no matter how large or small, anywhere, any time. We offer commercial, industrial, Marine and residential paving and related services. It's our promise to produce quality work, advanced skills, and a personalized experience. From engineer to supervisor to technician, all of our employees take pride in the work they do on every job. Our professionals are proficient in the evaluation and installation of any project. Our experts understand first-hand the issues involved with the most complex situations. Our teams consider, examine, and manage every variable. They conduct total assessment of the individual job and evaluate the materials to provide a professional installation. Our site consultants deliver quality work that will meet and exceed the customer expectations. We'll get the job done right the first time, on time, every time. In today’s economy, it’s more important than ever to get the most for your money. E.S. Paving saves you money by having professionals that are well-trained and experienced, ensuring top-notch work done right. E.S. Paving gives you competitive pricing, versatile planning, and rapid deployment. Every aspect of your project will have our fullest attention to detail. We stand behind and guarantee our work. We have an A plus rating on BBB and outstanding reviews from our customers. We are also a licensed company with the Maryland Home Improvement Commission. *Authorized Techo-Bloc Dealer* Meridian Landscaping and Design was founded by Tim Gardiner in 2005. Our vision is to create a company exacting in professionalism and flexible in execution to ensure that we meet the dynamic needs of our clients and their properties. We believe that our success can only be measured in terms of high client satisfaction and progressive employee development. Meridian is rooted in the aesthetic ideal that all properties, both small and large, should look their best. We offer comprehensive landscaping services from standard maintenance to design and installation. Many of our projects include expert masonry work and rely on the education of our horticultural and landscape specialists. 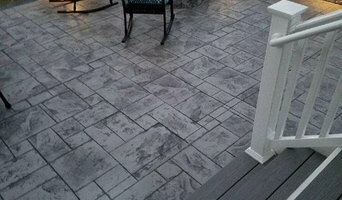 For an affordable yet high-end look in Woodbridge, VA, stamped concrete patios are the way to go. 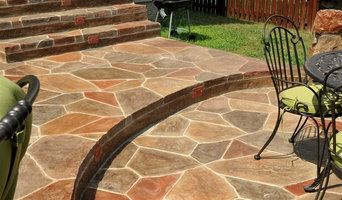 A Woodbridge concrete stamping professional can replicate the appearance of natural stone or pavers, creating a surface that requires minimal maintenance. 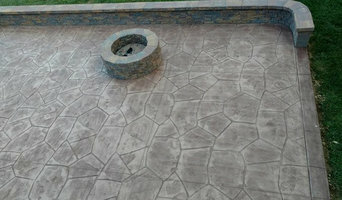 With endless decorative concrete design and color combinations, it’s important that any Woodbridge, VA stamped concrete contractors you’re interested in show you photos of their work to ensure you’re on the same page.